I went out on me boat today and sailed towards Lookout point and di’nae see anyone else today, and a bottle of rum! Aarrr! 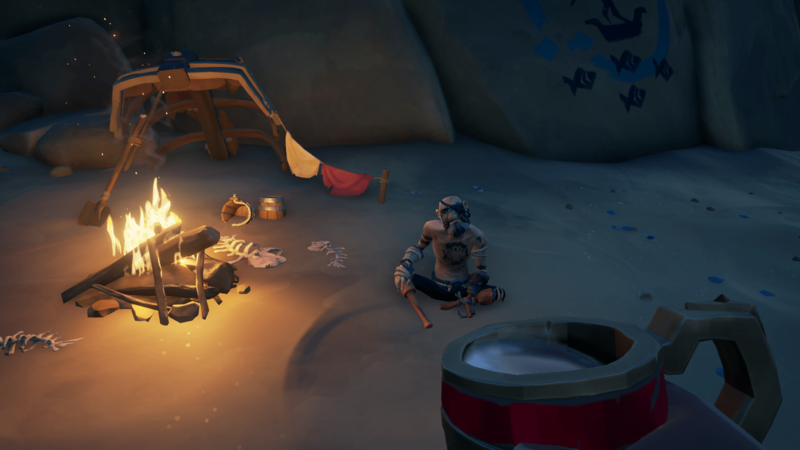 Yesterday I saw barnacle-covered Merrick drinkin’ alone at Sharkbait Cove. Drinkin’ and tellin’ everybody who wanted t’ hear about th’ thin’s he had seen. Fire the cannons, ye scurvey dog! A monster so large with tentacles more than ye could count, which in me case would be aroun’ five. A monster so big that it could pull yer boat under, a boat o’ any size, which would weigh anchor its crew helpless. Helpless as monkeys without bananas. Merrick obviously had seen t’ much rhum today. Yaaarrrrr, avast! Merrick always with his stories, and dinna spare the whip! Yaaarrrrr! Stories about how he seemingly misplaced his legs, avast. His legs, he tells everybody be somewhere in a beast. A beast he has seen with his own two eyes, when he still had that many. The ornery cuss even got tattoos t’ honor his foe.